The International Olympic Committee (IOC) has suspended its Brazilian arm amid an investigation into corruption allegations. 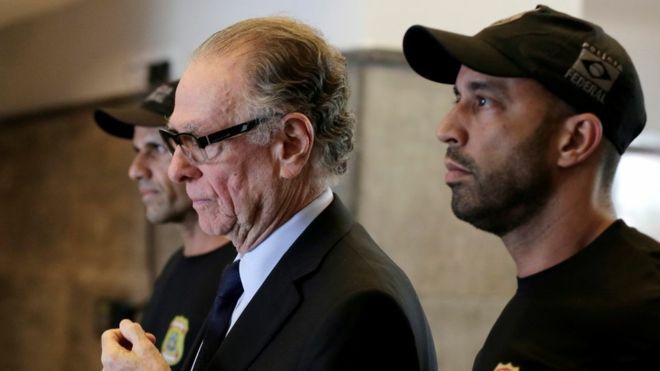 It also suspended the head of Brazil's Olympic committee, Carlos Nuzman, as an honorary member, and has frozen all its payments to the body. Mr Nuzman was arrested on Thursday and is being investigated as part of a cash-for-votes probe linked to the bid for the 2016 Rio Games. The IOC said Brazil's athletes would not be affected and they will continue to be paid. They will also still be allowed to compete in the Winter Games in South Korea in February. Leonardo Gryner, the Brazilian committee's director general, was also arrested on Thursday.